There has been an upsurge in violence in Jammu and Kashmir (J&K) in recent years. This has been accompanied by increasing cross-border violations by Pakistan and heavy retaliation by India. The Uri terrorist attack on September 18, 2016 — directed, equipped and supported by Pakistan, led to the surgical strike by India across the Line of Control (LoC), which caught Pakistan off-guard. These were followed by repeated attempts by Islamabad to disrupt the 2003 ceasefire along the LoC and hit at targets inside J&K through orchestrated terrorist strikes. 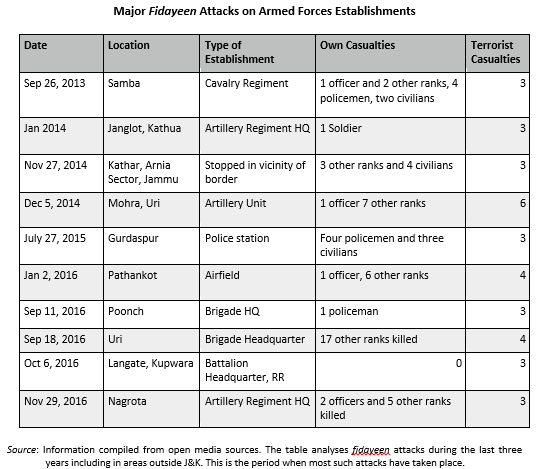 The brief analyses fidayeen attacks that have taken place during the last three years by Pakistan sponsored terrorist groups. It then delineates steps the security forces could take to counter such attacks effectively. According to a portal that tracks terrorism-related violence in South Asia, 2016 has witnessed the highest number of security forces casualties during the last eight years in J&K.1 The data suggests that 77 security personnel have lost their lives, even as 153 terrorists were eliminated until November 27, 2016. It also indicates that civilian casualties have come down to the least number since the beginning of insurgency. However, it would be useful to view these numbers in the right context, as the security situation in Kashmir reflects a change in strategy on part of Pakistan, which must be discerned with care. The high numbers indicated by the media in the recent past do not take into account certain variables that impact the increasing violence in the recent past. As an illustration, it has been stated that the army’s combat death toll in J&K is the highest this year. The figures are indeed high in comparison with previous years. The reasons accounting for the high figures are delineated below. First, cross-LoC violations have been unusually high this year and have led to a large number of casualties, especially of the Pakistani regular forces.2 These figures do not reflect Pakistan Army casualties, which when included, could take the ratio of casualties to similar levels as previous years. Second, the increase in casualties also indicates an upswing in the number of violent incidents and the corresponding increase in the intensity of security forces operations. As compared to 208 incidents in 2015, 283 incidents have already taken place till November 6, 2016 in J&K.3 This is a reflection of Pakistan’s desperate attempt at ensuring continued instability in the region. The decision of terrorist handlers to resort to fidayeen attacks illustrates this change in strategy and therefore calls for reflection by security forces in India as well. Third, the low figures of civilian casualties are indicative of the nature of operations being conducted in Kashmir. In the recent months, despite grave provocation, security forces have ensured minimal collateral damage, often at the cost of suffering higher casualties themselves. There has been a clear shift on the part of Pakistani handlers from preserving terrorists within J&K by avoiding encounters to fidayeen attacks. The very nature of these attacks — if successful in their initial attempt to close in with a target — can potentially give results far beyond the number of suicide attackers sacrificed. Kashmir is not the first or only instance where such attempts have come to light. The institutionalised expertise of the Liberation Tigers of Tamil Eelam (LTTE), followed by those witnessed in Lebanon, Iraq and closer home in Pakistan and Afghanistan are telling examples of the efficacy of these tactics. While even one loss is a loss too many, yet an objective assessment suggests that with the exception of the Uri attack on September 18, 2016, security forces have been able to contain the damage, despite the shift in strategy as indicated by the series of such attacks. 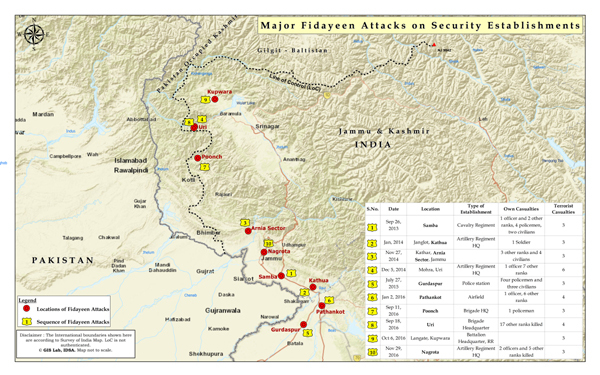 Even as some of these attacks are contained, fidayeen attempts, which include surprise and shock as essential elements, are bound to cause greater damage when compared to hit and run or standoff fire assaults. This clearly reflects in the casualty figures of 2016. There has also been a carefully calibrated shift in terms of the nature of the targetsat the receiving end of fidayeen attacks. Amongst the ten major attacks that have taken place in the last three years in the hinterland (refer Table 1 and Sketch 1), terrorists have struck an active battalion headquarter in an operational area, police stations, formation headquarters, peacetime military units and security establishments. These attacks seem to have been equally spaced between areas north and south of the Pir Panjal. However, they were relatively more successful in areas closer to the border or the LoC and along major arteries. The failures have taken place in areas further from the borders. This may have been due to the inability of terrorists to maintain their momentum, motivation and logistical support system. This can be seen in case of attacks repulsed in Janglot and Langate. The raising casualties of the Pakistani Army, both in men and material, could not have remained a one-sided phenomenon, with an expected backlash on the Indian side in terms of casualties. A look at the incidents post Uri clearly reflects this reality. Even as India extracted a heavy cost on Pakistan in terms of fatalities, morale and loss of face, the targeting of two military establishments by fidayeens in quick succession thereafter could have been the only low cost option available to Pakistan as a face saving measure. Given this desperation, fidayeen attacks can be reduced over a period of time with better procedures and preparedness. However, these cannot be eliminated completely and that is a reality that security planners and the population at large must acknowledge. This analysis clearly establishes that Pakistan stung by the humiliating cross-LoC surgical strike will continue to focus its attention on military, police and central armed police establishments which are seen as vulnerable targets for fidayeen attacks. This leads to the operative part of the policy brief, which attempts to concentrate attention on requisite means to reduce casualties in this regard. Stopping terrorists infiltrating from Pakistan into India remains the best way of avoiding and neutralising a fidayeen attack. This effort involving a section of about 10 soldiers on the LoC/International Border (IB) at the point of insertion saves the future effort of a division in an attempt to locate and neutralise the same terrorists at a later date and often at a heavy cost of own casualties. The dynamic nature of the deployment along the LoC, including the efficacy added by the fence, must be built upon and potential gaps plugged through multiple layers of deployment. The lower threshold of violence in the hinterland does open the possibility of redeploying Rashtriya Rifles in vicinity of the LoC for such a task. The situation is more complex along the IB sector. Here the limited numbers of the BSF do not allow a multi-tiered deployment like the LoC sector. This relatively low density deployment, despite the advantage of terrain when compared to the LoC, has led to infiltration in the past. The second criticality for avoiding casualties relates to enhancing the intelligence network and capacity that feeds into the security apparatus. Almost every terrorist strike is immediately followed by a report that suggests the dissemination of suitable warnings. Having served in J&K on more occasions than one and being in receipt on similar warnings, one observes that prudence lies in differentiating between generic warnings that cover most days of an year and ones that are target-specific, which are bound to be more useful for a military commander. In fact, one reason for complacency to set in is the very nature of these ‘cry wolf’ warnings which make it difficult to differentiate between routine cautionary indicators and the more serious ones. A third factor relates to measures required to strengthen protective measures in respect of potential targets. A comprehensive study of the same has been done in the past by a high-level committee headed by former Vice Chief of Army Staff Lt. Gen. Philip Campose. The study illustrates that the challenge is not related as much to understanding the nature of the threat existing at the target end, resources needed to safeguard it, or the procedures that require to be adopted to safeguard against fidayeen attacks. Rather, the challenge lies in implementing its recommendations. From the perspective of this brief, there is a clear indicator of the kind of targets that seem to repeatedly figure on the crosshairs of terrorist handlers. This raises the obvious question. Why have terrorists succeeded in causing severe casualties at some establishments, even as they have been stopped in their tracks elsewhere? Units and formations have succeeded or failed irrespective of their nature and composition. While some had a stronger periphery, others were protected merely by a strand of barbed wire. Despite this, they are able to successfully fend off terrorist strikes. This relates to the larger issue of how well is the security apparatus galvanised in a unit when compared to some others. Soldiers are mentally and operationally a part of a cohesive sub-unit which operates as a small body on a daily basis. In an operational deployed unit, soldiers carry their weapons on person and are attuned to using them at short notice. A soldier does not have to run for cover, since the deployment ensures a degree of defensibility and interlocking supporting fire. Quick Reaction Teams (QRT) rehearse their drills as a routine and are trained to move and deploy in quick time at short notice. Most importantly, the focus and mental preparation of each soldier, sub-unit and the leadership remains on operations and operations alone, without the blurring of their orientation by more routine and at times peacetime duties that can potentially take the attention of a soldier away from possible threats. There is therefore no excuse for a unit or formation in active operations to falter on these issues. Despite these attributes, in a peace station, a group of alert sentries, effective passage of early warning — as witnessed in case of Janglot, can still provide the necessary deterrence that can help eliminate the fidayeen. However, this alone cannot become the basis for preparing against terrorist strikes. The answer does not lie in converting these locations into hard field stations. However, it certainly does call for a two-fold initiative to enhance preparedness. One, all such establishments must be provided greater protection in line with the Campose committee recommendations. These include enhancing intelligence capabilities, isolating establishments from public passage as in the case of Nagrota, strengthening the physical infrastructure including perimeter walls, concertina coils, double or triple entry barricades, and security lighting among others. Vulnerable areas can be augmented further through the employment of training companies oriented towards countering terrorism, which will serve the dual purpose of keeping them oriented and buffer the strength of security forces in threatened areas. However, this must be undertaken in coordination with local deployment to ensure that command and control remains effective. It is more important to enhance the capacity of units and establishments to undertake such challenges within their own capability rather than merely relying on erecting physical obstacles. The experience of the cases listed suggests the need to balance between equipping at least a third of the unit strength with weapons and ammunition, despite drills to the contrary in peace stations. It also calls for ensuring that the Ghatak Platoon of every unit or an equal strength in a formation headquarters be trained and equipped to react to the kind of contingencies that have emerged in the past. The task such elite sub-units are required to perform to counter fidayeen attacks is specialised in nature which needs excellent situational awareness.This demands a degree of stability in their selection, training and continuity. Day-to-day changes in this regard cannot provide the requisite expertise to deal with the nature of threats that have to be countered. The inspection of units must focus more on their operational readiness against such attacks, including the efficiency of QRTs. These teams need to be equipped both in operational areas and peace stations with night vision devices, helmet-mounted communication systems, micro robots for room intervention to improve efficiency and reduce casualties. The establishment of a unified command centre to coordinate responses remains critical to a successful counter-terror operation. This has been a limitation in some cases in the past. In areas which have the presence of multiple security forces and lie on formation boundaries, it is all the more critical to ensure the same. As a guiding rule, a unit must develop the capability to neutralise the challenge posed by 3-4 terrorists within its own resources. The repeated call for Special Forces to undertake a task which is well within the capability of a unit does not reflect well on its capacity and training. Two, a unit can only undertake a challenge of the kind posed by fidayeen attacks if the psychological and mental orientation of its men is focused towards it. Military and police establishments that fall within the vulnerable zone of such attacks must retain this very orientation and continue to prepare for such an eventuality. It requires giving higher priority to training, enhancing operational drills and procedures, cutting down on peacetime spit and polish, especially if it competes for a soldier’s time and professionalism. The principle of ‘back to basics’ in terms of basic drills and procedures that are the strength of a regimental system need to be strengthened further. Three, the operational vulnerability witnessed in formation headquarters and logistics establishments must be addressed by assessing their operational role on the basis of counter terrorism drills and procedures. Lastly, such attacks cannot and should not create paranoia, especially in the hinterland. However, creating awareness about the potential for such attacks as well as ensuring basic defensibility of units and families is important. The antidote to fidayeen attacks is a well trained and informed soldier, who is clinical in his task of neutralising the threat as and when it arises. 1. ‘Fatalities in Terrorist Violence 1988-2016, satp.org (Accessed December 5, 2016). 2. A total of 159 violations by Pakistan had already taken place till November 8, 2016 as per Rajya Sabha Unstarred Question No. 86 answered on November 16, 2016. 3. Rajya Sabha Unstarred Question No. 86 answered on November 16, 2016. 4. Air Khan, ‘Jammu: Tunnels dug to facilitate terror activities worries BSF, security forces’, Mail Today, December 2, 2016, (Accessed December 3, 2016); ‘Terrorists in Army uniform attack police station in Punjab’s Gurdaspur ; 3 killed’, Zee News, July 27, 2015, (Accessed December 3, 2016); Vivek Chadha, Rumel Dahiya, Neha Kohli and Shruti Pandalai, ‘Uri, Surgical Strikes and International Reactions’, IDSA Issue Brief, October 04, 2016 (Accessed December 3, 2016). 5. ‘Terrorists attack Navy airbase in Karachi, destroy three aircraft’, Dawn, May 22, 2011, (Accessed December 5, 2016).